The federal government confirmed Tuesday that subsea clouds of dispersed oil have been found at least 40 miles from the site of the Deepwater Horizon oil leak in the Gulf of Mexico. The finding, which confirms what some independent scientists first reported last month, has renewed concerns over the effects of the oil spill on deep-sea life. “NOAA is confirming the presence of very low concentrations of subsurface oil down to 3300 meters, 42 miles north of wellhead,” NOAA administrator Jane Lubchenco said in a news conference. Until Tuesday, BP CEO Tony Hayward said there was no evidence that the underwater oil clouds existed. NOAA independently tested samples of ocean water provided to them by a research team from the University of South Florida aboard the research vessel the Weatherbird II. 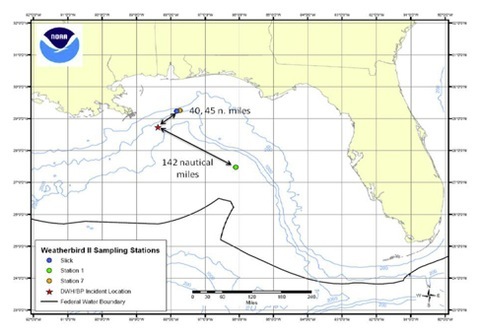 The NOAA analysis found detectable levels of oil at a spot 40 miles northeast of the leaking Deepwater Horizon well. Using chemical fingerprinting, they found that the oil collected at the surface there could be traced to Deepwater Horizon well, although the subsurface samples had too low a concentration of oil to make that connection conclusively. Read the full report here. The University of South Florida team, in a separate analysis, also found subsurface oil at that spot. Peebles said that a research team affiliated with the university had previously looked for hydrocarbons in the water in the area as recently as last November, and hadn’t found any. But he added that that was “circumstantial evidence, not proof” that the oil detected this week comes from the Deepwater Horizon well. And in fact, the NOAA analysis found that other samples taken 142 miles southeast of the well head contained dispersed oil whose chemical fingerprint did not match the Deepwater Horizon leak. Still, the government finding has renewed concern over the possible effects of oil on deep-sea life. Because oil is lighter than water, oil from ocean spills generally collects on the top of the water, where it endangers birds and other wildlife that live near the surface but spares deep-sea life. But this oil leak is different, because the oil is escaping at such a deep depth — more than 5,000 feet under the water — and with such great pressure. Think of it as gas-saturated oil that has been shot out of a deep sea cannon under intense pressure – it’s like putting olive oil in a spray can, pressurizing it and pushing the spray button. What comes out when you push that button? A mist of olive oil. This well is leaking a mist of oil that is settling out in the deep sea. Scientists are worried that the oil mist could have toxic effects on deep-sea life, including coral reefs. The oil could be toxic in and of itself, they say, and could also cause an overgrowth of microbes that feed on it. Those microbes use up oxygen in the water, which could lead to a depleted oxygen supply, suffocating other sea life. Peebles said the water at the Weatherbird’s sample site appears to have sufficient oxygen despite evidence that microbes have already been eating the oil. But Samantha Joye told Newsweek that the water at her sample site was 30 percent less oxygenated than usual — not yet enough to cause problems, but well below normal. Joye is also worried about the effects of the dispersants being used to break up the oil.